Do you remember when you were a little kid, say around nine-years-old, and your dark bedroom was scary? With the covers up to just below your eyes, you'd listen to every creak or see the moonlight shift the shadows throughout the night and think that something was in there with you. Now imagine again that you're nine-years-old and you have this fear, but let's pretend you're not in your safe bedroom at home, but instead you're lost. Lost in the big, bad woods in northern New England that stretch for hundreds of miles and you cannot find your way out. With one older brother, Peter, together they've moved with their mother into a new neighborhood after their parents recently divorced. Trisha and Peter only get to see their father every other weekend or so, and only then is when she can talk about baseball, and her love for her favorite baseball pitching closer, Tom Gordon. When they're not visiting their father, they attend their new school and visit a museum one weekend, the movies the next. Divorce is never easy, and their mother is trying to make things as much fun as possible to make the transition easier. On a clear day, Trisha, Peter, and their mother go on a new venture and take a hike through the woods. With a few supplies and food for the day, they begin their trek. It's only when her mom and Peter are in yet another argument about the change in schools that Trisha decides to slip off the trail to use the bathroom. Without telling either of them where she's going, she steps off the path and makes her way further into the woods to find a private spot where no one can see her. When she tries to return to the path, she realizes she's turned around and doesn't know where to go. With a fateful step in the wrong direction, she gets immediately lost and begins a journey that will make her grow up much, much too soon. Carrying her meager supplies and a small Walkman that brings her the Red Sox games on AM stations, Trisha's coming-of-age tale with thoughts of her family, the divorce, baseball, and survival, is heart-breaking. I was absorbed in this story and cheered for Trisha, hoping that she would somehow make it out and be back home with her family. I was struck yet again by how Stephen King can just tell a story and make it feel so real. And there's just something about the way Stephen King writes about kids that makes you feel like you're always choking back tears. I loved everything about this story. While I missed how Stephen King brings the back story of minor characters into the mix of it all, I was completely okay with that because the overall story is so refreshingly different than what he's done before in the books I've read this year. The story of a nine-year-old relying on herself to survive, battling the elements and her own inner doubt, coming to terms with divorce and the change in seeing her father consistently because of it, her love of the Red Sox and particularly Tom Gordon, was all incredibly genuine and touching. When Trisha listens to the Red Sox games on the radio, my heart broke, and when she began to see visions of Tom Gordon accompanying her through the woods in his baseball uniform, it broke a little bit more. This is one of Stephen King's books that seem to pit fans on one side of the fence or the other. A quick scan through the StephenKing.com fan forum reflects this polarization and a lot of it seems to come down to whether or not it's good because it does, or doesn't, include a strong supernatural element. Granted, there was just enough to cut your teeth on, but this was not a horror story at all; rather, it's a story of a little kid's survival through the woods of New England all on her own. With her limited knowledge of things that you can eat in the wild, she makes a lot of good choices and some bad ones. Some fans feel Trisha acted a lot older for her age, but I honestly didn't think so. I felt like it was a good representation of the body and mind willing itself to survive, fighting death no matter what, and I could completely believe that a nine-year-old who might be lost in the woods during the summer might be able to make it through, and I was hoping for it. It didn't seem like such high-falutin' nonsense to me. Her thoughts were "young-like," especially her own chatter to herself when she needed to hear a voice. Even if she was talking to the reassuring image of Tom Gordon in his Red Sox baseball uniform. It all fit just right. If anyone read Lisey's Story, part of me thinks that maybe Trisha got lost in the land of Boo'ya Moon. Final Thoughts? 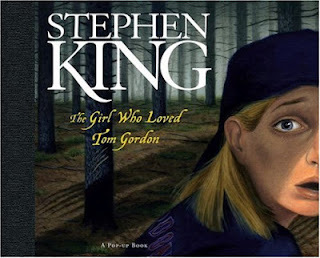 In comparison to Stephen King's chunkster books, The Girl Who Loved Tom Gordon is a quick read at 219 pages and is daggone good. It would be a good selection for those who want to try Stephen King but don't want to start out with his books that include supernatural elements. Tom Gordon was the Red Sox closer for a few seasons, and man, he was good. 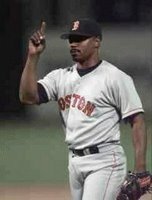 Pitching with the likes of Derek Lowe and Tim Wakefield, it was Tom Gordon who was brought in at the end to seal the deal, his famous finger-pointing to the sky acknowledging the one above for the win. Trisha's fan reverence of Tom Gordon centers around his consistent talent and his incredibly calm demeanor as he looks in to the catcher, Jason Varitek, for the signal, swirling the ball behind his back before his wind-up. It's this strength in "stillness" before the pitch Trisha's always admired and what she now needs to rely on within herself in order to do everything she can to make her way out of the woods. 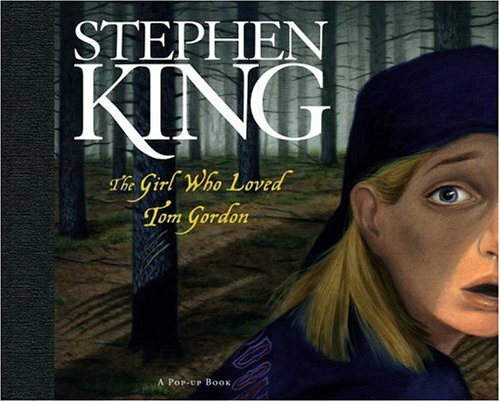 The Girl Who Loved Tom Gordon is now also a pop-up children's book and was being discussed for a film adaptation, but looks like talks on it have stalled. The Stephen King Project. My education (and others') continues! The Girl Who Loved Tom Gordon is another selection for the challenge Kathleen and I are hosting. The site can be found (with other participants' reviews) here. I wasn't a fan of this one. I think it ended up a DNF, actually. Given, I was reading it as a 19-year-old undergrad IN MY ASTRONOMY CLASS. Auditorium, 200 students, boring prof. You get the picture. I can only imagine reading this one in your astronomy class! Too funny. This was my first taste of SK about 2 years ago, I don't think anyone should start with this one, I found it 'boring'. I have tried another and realised his writing style is just not my cup of tea but overall this story just didn't go anywhere, it had the same slighly creepiness the whole way through which was boring to me. I was wondering if you would like this one or not. I know SK is definitely not your flavor, Marce, but I so wish he were! For some reason, I just love his writing style and his quirky sense of storytelling and especially, the genuineness of it all. For this book, I do think there was a creepy sense to it all, but I understood it because it was a little kid getting lost in the woods. I can only imagine how frightening it may have been, where the monsters that you think are visiting your nightmares suddenly become present in this scenario. She might have been hallucinating for some scenes, too, which made sense to me as well. I really enjoyed this story and thought it was a good option for those who might not want to try his books that are more labelled as "horror." Some books work for some and not for others. I am not sure how I would feel about this one, seeing as it has some elements of baseball in it, but like you say, it's not really about baseball; more about a child's journey. I am thinking that this would be something that I would rather listen to than read, but your review was beautiful, and really captures the spirit and flavor of the book. Thanks for sharing it with us. I might be able to handle this one because it's not a horror story. I definitely think this would be a good one for those who don't want to read horror, but want more Stephen King. While it's not as "epic" as 11/22/63, it's definitely one that I found to be engaging and is also a quick read. I hope you get a chance to read/listen to it and enjoy it! I like the sound of this book. It's been years since I read Stephen King and I've wanted to read some of his books but I honestly couldn't decide what to start with...there are so many! I don't have children but I've spent a lot of time with a lot of kids and one thing I've learned is their age doesn't necessarily correspond to their level of maturity, intelligence or behavior so I don't think Trisha acting older than her years would bother me. And your review and how much you liked this book piques my curiosity. Terrific review, Natalie, Thank you! Great perspective, Amy, thanks! I do feel strongly that the will to live is greater than a person's years, so if the body wants to survive, it will do everything it can to try. 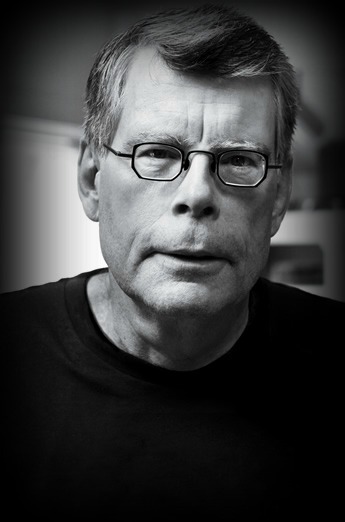 I really enjoy Stephen King's works. I've read a few recently that I've liked but weren't my favorites, but this is one that just stuck with me. I hope you read and enjoy this as well! I need to read this one for the project! Screw the fact that I wanted to read stuff in chronological order. I'm missing out on too much good stuff by doing it that way! Kathleen, too funny! I gotta tell you, I think it's awesome that you're trying to read it in order! I don't have the discipline for that and I know you're going to experience the evolution of his writing and you'll just "get" all of his inside jokes that always seem to pass me by since I'm reading out of order. This one sounds like a King novel I would thoroughly enjoy. As I've only recently joined the King challenge I need to stretch my scope and read more of his books! Think I'll check this one out from the library ~ thank you for the recommendation! I'll let you know what I think! This is a quick read compared to his chunkster and it really captured my attention. I hope you enjoy it, Stacy! I read this when I was much younger and really liked it. I think it's probably the only Stephen King novel other than The Green Mile that I ever reread. The two biggest things about it that have stuck with me is Tom Gordon pointing at the sky (and watching a baseball game with my dad in hope of seeing him do it) and, should I ever get lost in the woods, to leave my trash around to help people find me. Very different than most of what I've read by King (though it's been a while since I read anything) but so good. I adore this book. I started reading King when I was in Junior High (almost 30 years ago), I always loved the SCARY ones, I enjoyed the ones that aren't so crazy scary, like Dead Zone. As I gotten older I still love the scare but these are the ones I love best I think. 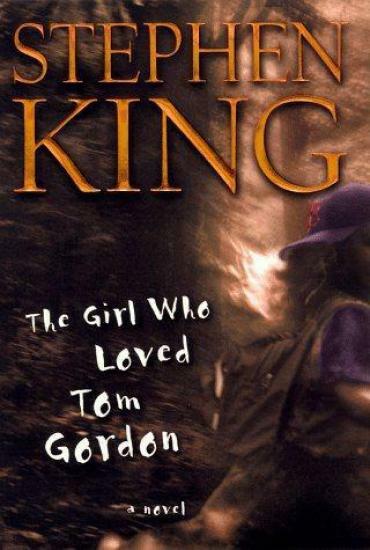 I have read The Girl Who Loved Tom Gordon many times. I almost need to read it in one sitting, especially the first time, because I didn't want to leave her in the woods, I needed to see her through safely, as unharmed as possible. As a New Englander, a Red Sox fan and a mother and former 9 year old it speaks volumes to me. I can attest to it's accuracy,yet he paints the woods,the mystic and feel of the Sox and their Nation and Trisha so well you don't need to be from there, know baseball or be a parent or a little girl to hear. The human spirit sings in this little book.